The first issue of Judge Dredd: Toxic introduced us to a symbiotic alien creature that has been hosted by workers in The Spillover, the sewer system of Mega-City One. The workers down there claim the aliens help them to survive in harsh conditions but above ground, the Anti Alien League is raging about these unregistered aliens living among them. Subtle? Nope! Poignant? Damn straight. 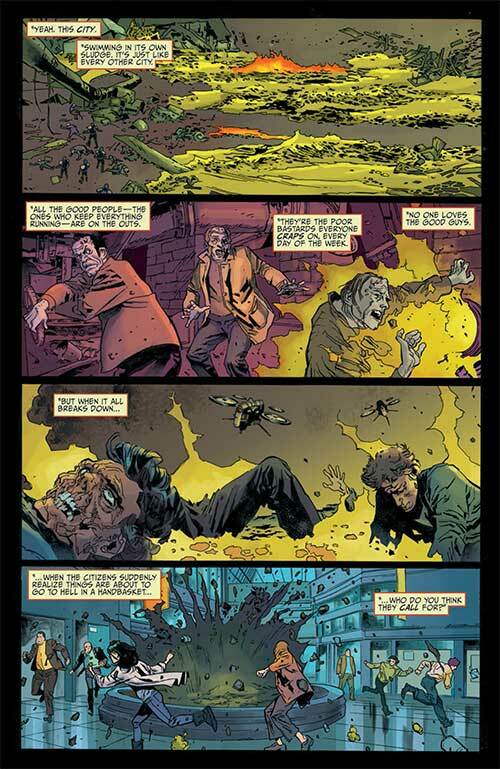 The second issue opens with a scene where the citizens of Mega-City One are surprised by an underground explosion that sends a green liquid shooting into the sky. 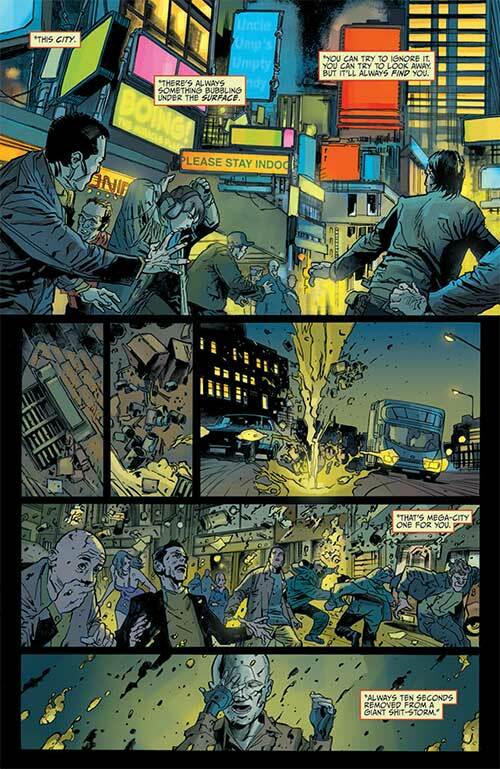 Dredd and the other Judges work crowd control and try to contain the mess – it turns out that this is waste product containing ultra-carborane acid, the people and the area are starting to dissolve. Clearly, that’s less than ideal and it’s happening in other neighborhoods as well. Soon the city is going to be swimming in its own waste. 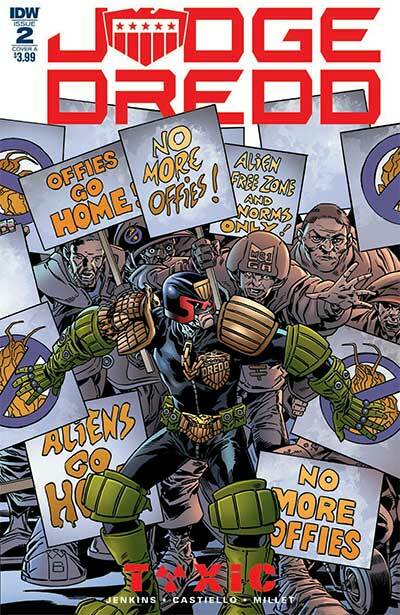 As the problem just gets bigger and bigger, Dredd and the other Judges get out of the area. A week later and the city is trying to clean up. Some of the Scrubbers, those that work in the sewers, appear to have made it to safety but it’s unclear how many of them. 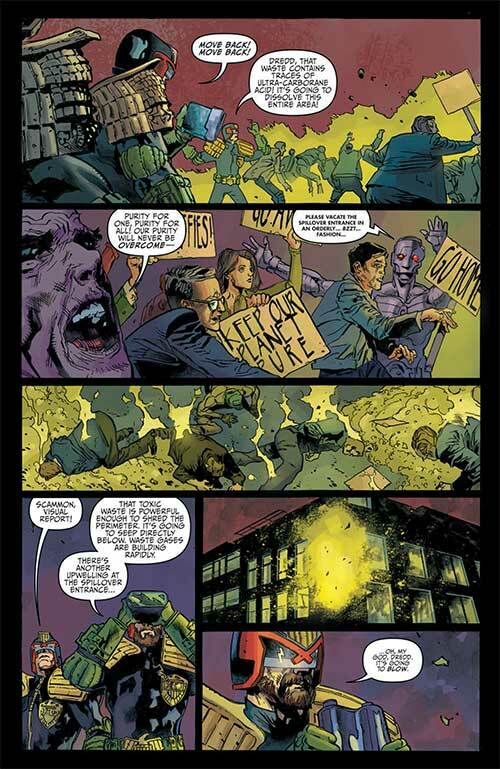 Unfortunately, Smed, the leader of the Scrubbers, has an issue that he brings up to Dredd face to face – the whole alien thing, it’s made the Scrubbers look like criminals in the minds of some citizens, outcasts, and as such, they’re quit. There aren’t enough of than anymore to keep running the sewers and keep Mega-City One functioning . Robots have been brought in to replace them but many of these droids are old and won’t function for too long down there. If the droids don’t last more than a few hours the toxic gases will build up to dangerous levels and the city will get very toxic very quickly. Anderson suggests getting more of the symbiotic aliens some human hosts to replace the Scrubbers that have left. 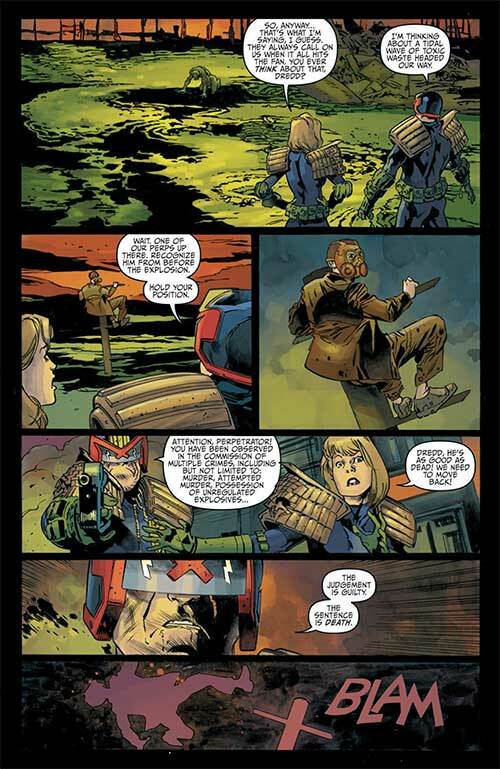 Dredd, assisted by Judge Scammon, gets info from a dirt bag named Harkie who eventually is forced to assist them in finding more of the aliens, but then some of the gun-toting rednecks from the Anti Alien League show up. As the politics of the situation heat up, everyone above ground starts to head into panic mode… and then the ventilators stop working. This will get worse before it gets better. Torn from the pages of today’s headlines, Paul Jenkins’s story is as subtle as a kick in the groin but it works. 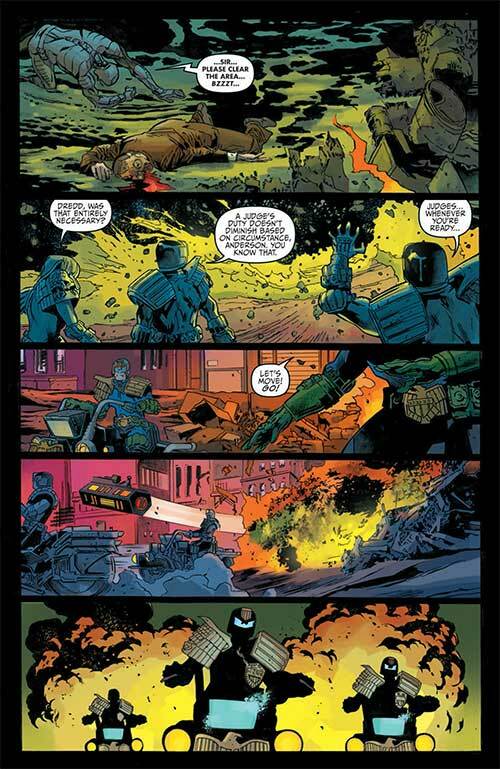 The best Dredd stories don’t need to be subtle, they need to be observant and this one is nothing if not observant. By channeling some of the anti-immigrant hysteria perpetrated on America by the current occupant of the Oval Office, Jenkins has found an earnest platform off of which to launch his story and it works really well. You can’t not start to think about America’s own situations as you read this, and that is surely a big part of the point. At the same time, it’s a pretty gripping read. There’s a lot of suspense here, the expected doses of black comedy and some solid action scenes as well. Dredd is Dredd, the stalwart embodiment of the law that he’s always been, while the supporting character humanize the story nicely. Marco Castiello does a very fine job on the artwork. The coloring from Jason Millet and inks from Vincenzo Acunzo helps bring it to life nicely. There’s good detail here, impressive panel layouts and a very good flow to the illustrations that help to keep Jenkins’ story moving quickly. There’s good detail in the foregrounds and the backgrounds while the human characters that populate the story are well-rendered with expressive eyes and faces. This all comes together nicely – bring on issue #3!